When it comes to tackling demographic change in Asia, there’s no one-size-fits-all strategy for policymakers. In some countries, like Japan, the population is aging rapidly, and the labor force is shrinking. In others, like the Philippines, young people are flooding the job market in search of work. As our chart shows, the impact of aging could potentially drag down Japan’s average annual GDP growth by 1 percentage point over the next three decades. While in India and the Philippines, which have some of the youngest populations in the region, a growing workforce could potentially increase GDP by that same amount. The chart also highlights the dimension of the challenge. Overall for Asia, the demographic dividend, where a young, growing work force (aged 15-64) helped drive the region’s rapid growth in recent decades, is coming to an end. Fertility rates are declining and people are living longer. Now many countries, particularly in East Asia, will be the fastest-aging societies in the world in the next few decades. The region’s population growth, which is already negative in Japan, is slowing and projected to fall to zero by 2050. More than a third of the population in Singapore and South Korea are at least 50 years old; in Japan that share is close to half the population. As a population grows older, there will be fewer workers. Asia’s workforce is expected to shrink by hundreds of millions of people. For instance, China could potentially see a decline of 170 million people in its working-age population over the next three decades. Over time, a shrinking workforce and aging population can mean a rise in healthcare costs and pension expenditure. This puts pressure on government budgets, and can translate into lower growth, unless a country has policies that support productivity and high quality jobs. By contrast, other Asian economies, such as India and Indonesia, should benefit from a demographic dividend, with a growing working-age population and higher fertility rates. 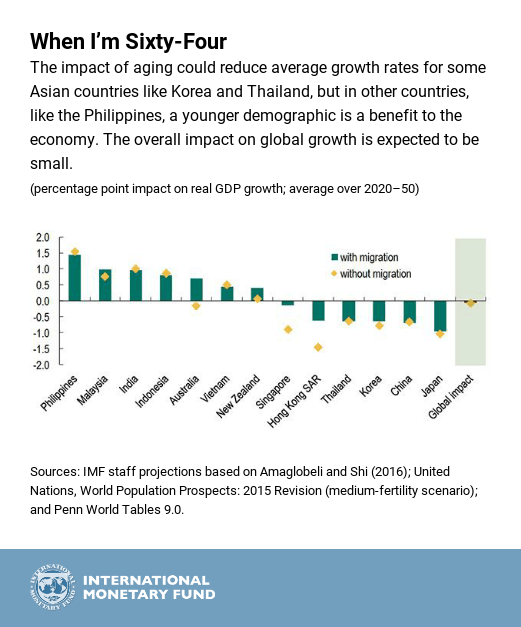 As these demographic trends shape these economies’ future, the role of policies will matter. In particular, labor market reforms can be key for ageing societies. By encouraging foreign workers, including through guest worker programs, migration can soften the adverse growth impact of rapid aging by partially offsetting the expected decline in the domestic labor force. Raising the labor force participation of women by, for example, expanding child-care facilities in countries like Japan, and promoting flexible employment can also help reduce labor shortages, and mitigate the adverse growth effects of aging. Stay tuned for Chapter 2 in the upcoming Regional Economic Outlook for Asia and Pacific countries, which we release on May 9, for an in-depth analysis on what Asia’s demographic landscape means for economic prospects.